Does an occupied rooftop/roof deck need to be included in allowable building size (height and area) calculations? Occupied rooftops are becoming common in multi-family and commercial buildings as building designers and owners seek to increase marketability by offering amenities such as roof decks. In most cases, these roof decks are open and uncovered with half height walls/parapets around their perimeter. However, some or all of the roof deck space may also be enclosed by full height walls and a roof covering. In both scenarios, questions that often arise include whether the roof deck needs to be considered as a separate story and how the occupancy and area contribute when evaluating height and area requirements based on a specific construction type. Code language regarding this topic continues to evolve. Under the 2012 and 2015 IBC, some feel that the relevant code provisions leave room for interpretation. As such, a design team may choose to consult with the Authority Having Jurisdiction (AHJ) regarding what he or she deems acceptable. Code changes set for inclusion in the 2018 IBC further clarify provisions on this topic (see below). In the meantime, following is a summary of how designers in the U.S. have successfully implemented occupied roof decks in their projects without including them in the total building’s height, number of stories and area. 1006.3 Egress from stories or occupied roofs. The means of egress system serving any story or occupied roof shall be provided with the number of exits or access to exits based on the aggregate occupant load served in accordance with this section. The path of egress travel to an exit shall not pass through more than one adjacent story. Approved code changes set to take effect in the 2018 IBC support this point (see code change G24-15, public comment #2). IBC 2018 Section 302.1, which covers occupancy group definitions, includes the following to clarify how occupied roofs are classified: “Occupied roofs shall be classified in the group that the occupancy most nearly resembles, according to the fire safety and relative hazard involved and shall comply with Section 503.1.4.” Section 503.1.4 provides options for not requiring the occupied roof to be included in the building’s number of stories or area. 503.1.4 Occupied roofs A roof level or portion thereof shall be permitted to be used as an occupied roof provided the occupancy of the roof is an occupancy that is permitted by Table 504.4 for the story immediately below the roof. The area of the occupied roofs shall not be included in the building area as regulated by Section 506. Although these changes won’t go into effect until the 2018 IBC, some designers have already used this approved language to justify occupied roofs and associated building size analyses. Examples of approved occupied roof decks can be found in the following appeal rulings from the city of Portland, OR. When evaluating the impact of occupied roof decks on the overall building size limitations, another consideration is whether the project qualifies as a high-rise building. IBC Section 202 defines a high-rise building as “A building with an occupied floor located more than 75 feet (22 860 mm) above the lowest level of fire department vehicle access.” IBC Section 403 provides specific provisions that apply when a building is classified as high-rise. If the occupied roof deck exceeds this 75-foot limitation, discussion of this topic with the Authority Having Jurisdiction is recommended to determine whether application of the high-rise provisions is required. Through use of IBC Section 104.11, Alternate Design and Methods of Construction, some projects exceeding this limit have been successfully approved and were not required to be classified as high-rise. In many of these cases, acceptance was on the basis that the occupied roof decks were relatively small in area and/or directly serving the needs of the level below and seen as an extension of that level. In general, occupied roof space with structure above is used for assembly occupancy (A-2) and will be considered a story per the definition of a story (see above). 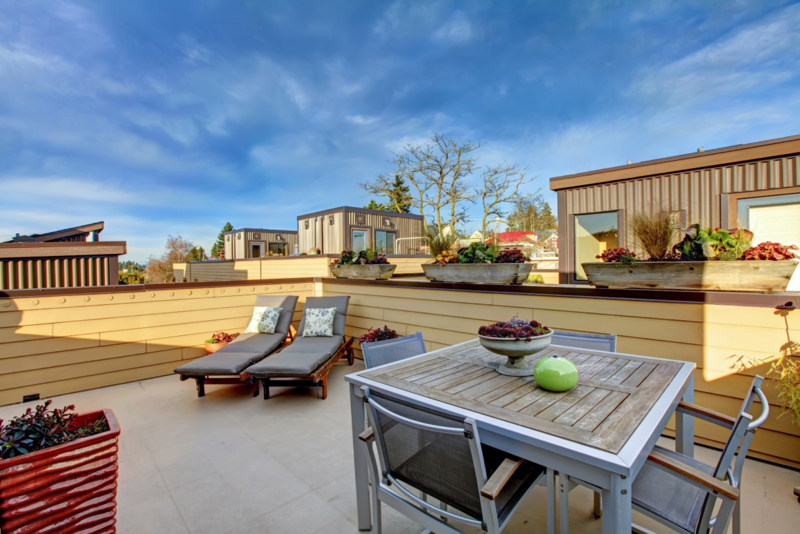 Considering a roof deck as a story may be acceptable when the height of the deck does not exceed 2-3 stories depending on the construction type and whether or not sprinklers are used. When exceeding this height, the most feasible alternative is to consider it an accessory occupancy (IBC 2012 505.2 and 508.2). The accessory provisions may potentially be applied to common spaces, provided they are no larger than 10% of the floor area they serve. Alternatively, the small assembly space provisions of IBC Section 303.1.2 could be used to classify the occupied roof space as Group B, provided the limitations of that section are met. The advantage of utilizing this section is that Group B occupancies typically permit more stories than group A-2 occupancies.